If you are like us, you are probably starting to think about gifts you can make for Christmas. Giving something handmade is really in keeping with the true spirit of Christmas. 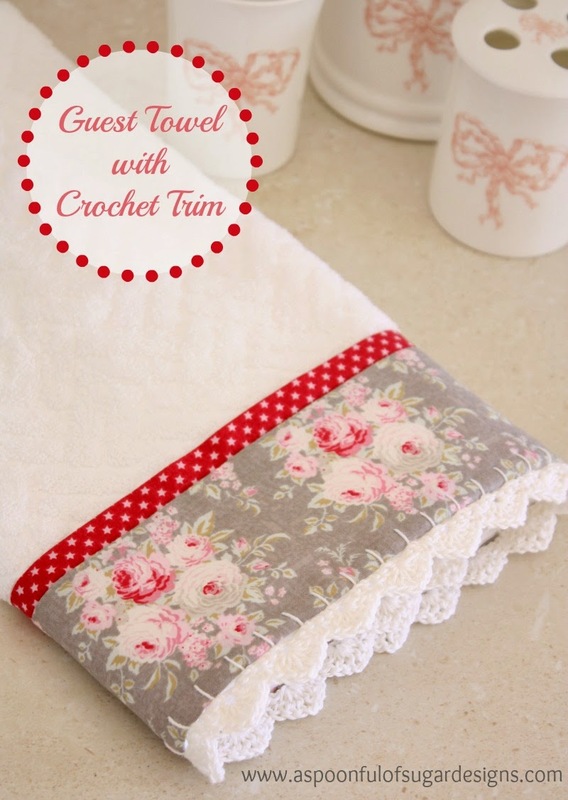 A Guest Towel that is trimmed with some pretty fabric and a crocheted edging is the perfect gift for Grandma, a teacher, or a special friend. You can team it with some hand cream or body products. Or you can simply make a pretty guest towel to add some Christmas cheer to your powder room, when you are entertaining over the holidays. We trimmed out Guest Towel with some pretty Tilda fabric, from the Sweet Christmas range. What we love about this Christmas fabric is that it has a vintage appeal, and could be used throughout the year. Fold the star print in half lengthwise with the wrong sides facing, and press. 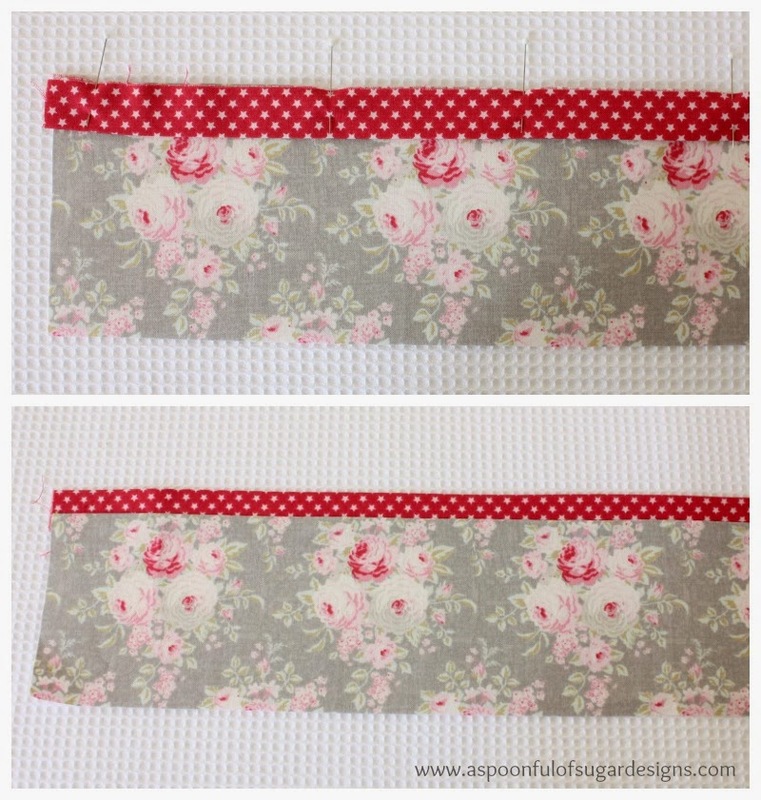 Pin this strip to the top edge of the floral print, and stitch in place using a 1/4 inch seam. Press under 1/4 inch along the bottom edge of the floral print, and press under 1/2 inch on both sides of the floral print. Pin the fabric strip to the bottom of the guest towel so that the bottom edges and sides are aligned. 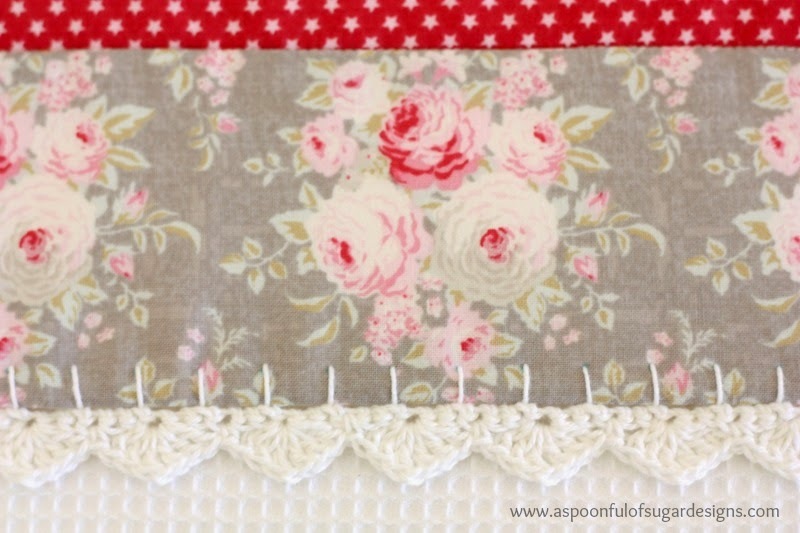 Machine stitch along the top of the fabric strip, where the star and floral print join. 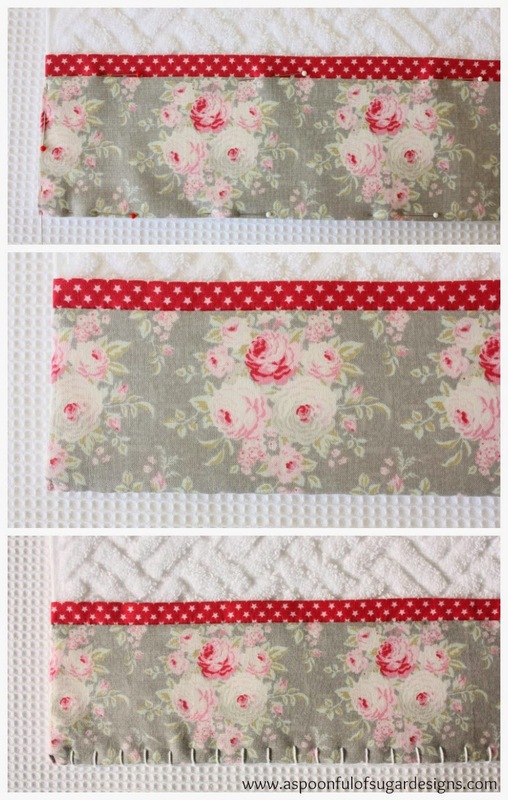 Hand stitch the sides and bottom of the floral print to the towel. 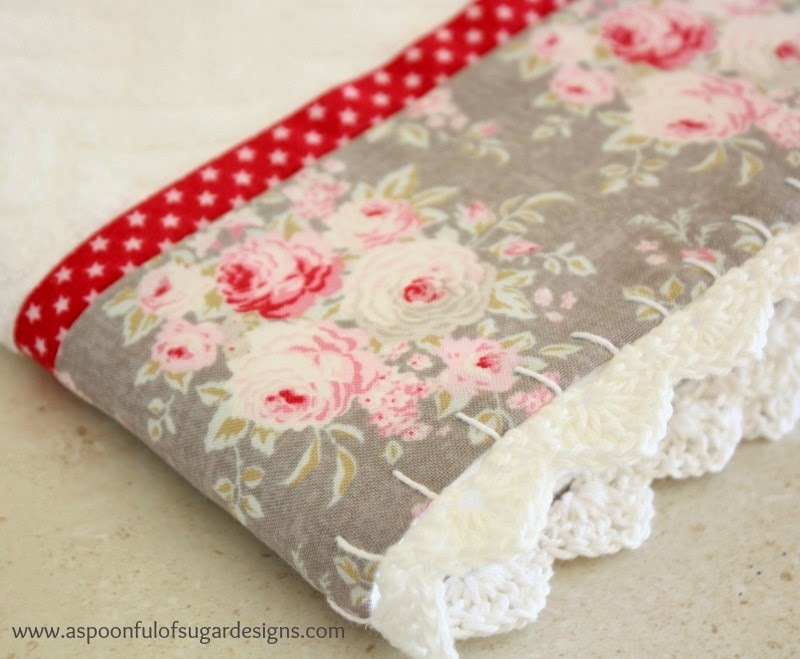 Cut a length of crochet cotton that is approx 3 times the width of the hand towel. Blanket stitch along the bottom of the hand towel so that the stitches are 1/2 inch apart and 1/4 inch deep. This will form the foundation for the crochet trim. Row 1: Crochet 3 sc into each blanket stitch. Row 2: Single crochet in first stitch, skip next 2 stitches, * 3 double crochet, 1 chain, 3 double crochet all in the next stitch (shell stitch made), skip next 2 stitches, single crochet in next stitch, skip next 2 stitches **, repeat from * to ** as many times as needed. Thanks to Sew Creative Supplies for supplying the Tilda fabric used in this project. Sew pretty! What a wonderful idea for gift giving or as a way to pamper guests. Thank you for sharing the beauty you create and inspiring us, Lisa and Sarah. Thank you for the tutorial! Do you prewash the towel, in case of shrinkage? Прекрасное украшение и сложное! Изысканно. 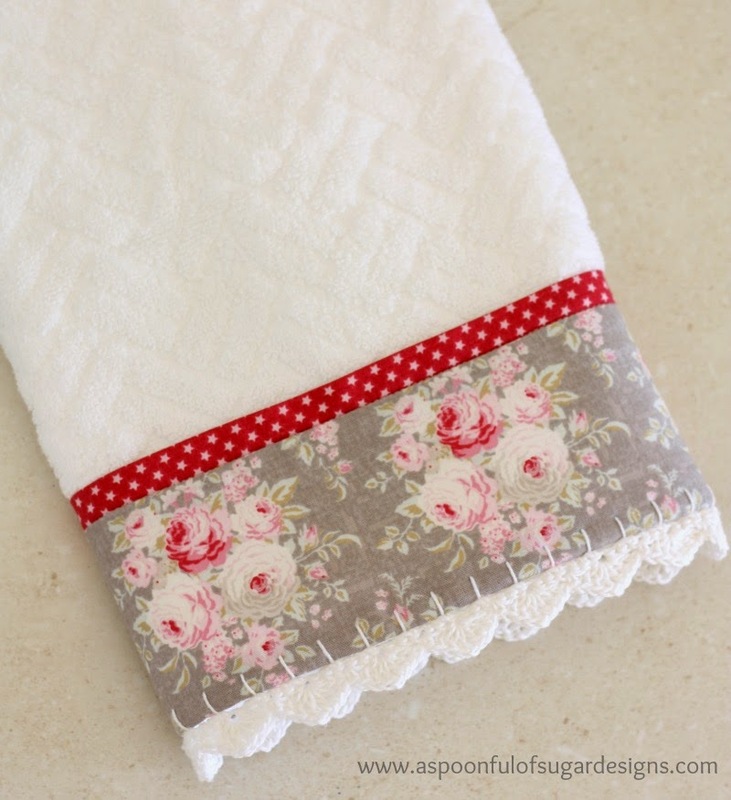 Beautiful guest towel – thanks so much for your how-to. So pretty! It would make a gorgeous gift! Beautiful guest towel! Thanks for sharing. I’ve done a similar idea but do a pocket trim on the bottom so both sides of the towel are the same. Love it! Wish you had a download button though!